This review is by Giulio Prisco of the skefi’a science fiction website. You can read it below or go to the skefi’a website for the original. 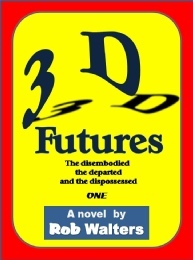 3D Futures: The disembodied, the departed and the dispossessed, by Rob Walters, is a fresh, entertaining and thought-provoking science fiction novel with interleaved stories, including a thriller in a future society of uploads. The novel is set in the 23th of 24th century, or so I guess from hints in the book: a World Constitution (something that may happen in a few decades) was adopted in 139 Before Separation (BS), and the events in the book seem to take place at least a few decades after the Separation. Read on to find out what the Separation was. Most of humanity, the Dispossessed, have returned to savagery, with some communities trying to slowly rebuild civilization after the Separation. En route to the stars to settle a new planet, the spaceship Shi Shen is populated by a few thousands of people, the Departed, mostly of Chinese origins. It was launched by the Chinese Economic Entity, one of the world powers before the Separation. The Separation: after the development of mind uploading technology, most among the rich and powerful have chosen to upload and become the Disembodied, living as pure software in Cworld, a virtual world running on supercomputers on Earth and in space. For a first science fiction novel, this is a great one. I encourage you to buy the book for 0.99 US$ (yes, 0.99 US$) at Smashwords. You will not regret buying the book: perhaps this is not a Hugo or Nebula winner, but it’s solid, well-thought, and entertaining science fiction for many hours of reading pleasure. There are four interleaved stories. One sketches the history of the world from our days to the World Constitution, the launch of the spaceship Shi Shen, the development of mind uploading technology, the Separation, and the development of the Disembodied society in Cworld. The other three stories are narrated by Remus, the leader of a small band of Dispossessed, Tali, a young Departed on Shi Shen, and Zimbaud, a Disembodied in Cworld. I found especially interesting Zimbaud’s story in Cworld. In this thriller, Zimbaud and friends must find and defeat the source of a mysterious influence, a software “corruption” that threatens all Disembodied with madness and eventually dispersal, the disintegration of personal software identity. In the story, which strongly reminds me of Greg Egan’s Diaspora, we see many features of Cworld history, technology, and society, shown in-depth and with attention to detail. Remus’ adventures, a classical post-apocalyptic “science fiction western,” lead his little band to a settlement where people try to rebuild a functional, civilized community. To ensure the security of their new home, Remus’ band will have to fight the savage Morgants, whose apocalyptic “religion” offers hopes to gain immortality in Cworld… as a prize for slaughtering enough people. Tali’s thread is the coming-of-age story of a young rebel in the small society of the Shi Shen starship. Planned by the Chinese bureaucracy before the Separation, the starship is governed by a militarized crew with strict authoritarian rules under a benevolent cover, ubiquitous surveillance, and mind-wiping (or worse) for the dissenters. The crew seem to have lost control of the starship, which of course is kept secret from the passengers. Tali and a handful of rebels will take back the control of Shi Shen with the help of a “ghost in the machine,” and perhaps they will steer it back to Earth. The three story threads, initially unrelated, come loosely together at the end. But there are still many questions to answer and much to be seen in Walters’ 3D Futures universe, and I definitely look forward to reading the promised sequels.